Greeting from the organizing committee of UP-UK APPICON 2018! 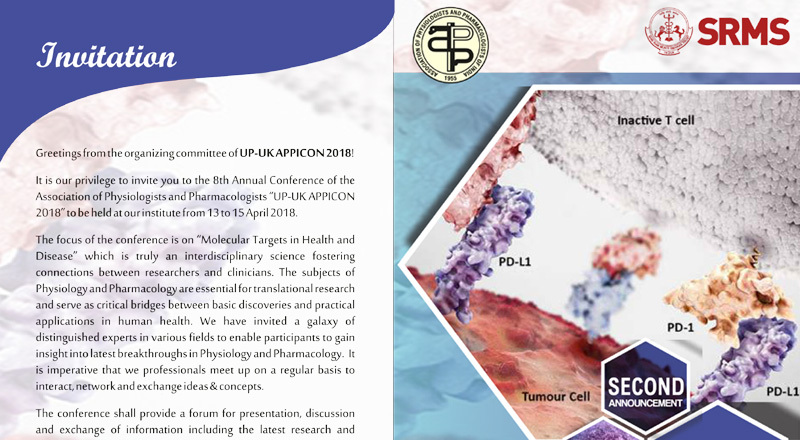 It is our privilege to invite you to the 8th Annual Conference of the Association of Physiologists and Pharmacologists “UP-UK APPICON 2018″ to be held at our institute from 13 to 15 April 2018. The focus of the conference is on “Molecular Targets in Health and Disease” which is truly an interdisciplinary science fostering connections between researchers and clinicians. The subjects of Physiology and Pharmacology are essential for translational research and serve as critical bridges between basic discoveries and practical applications in human health. We have invited a galaxy of distinguished experts in various fields to enable participants to gain insight into latest breakthroughs in Physiology and Pharmacology. It is imperative that we professionals meet up on a regular basis to interact, network and exchange ideas & concepts.